See follow up article I am the Serpent Bearer featuring a powerful dream I had suggesting the original serpent bearer may actually have been feminine. This can only happen every 12 years and is activating possibilities of a new dream and a new reality, a new form, a new sustainable way of living the life we are living. How can we more fully participate with that? In 2019 Venus passes this star on November 19, and Mercury is here on December 23. In 2020 Mars passes by here on February 05. The Moon passes this star once each month see below for 2019 and 2020 dates. “Ophiuchus means ‘he who holds the serpent’ and that is how he is depicted. … on equal terms with equal powers”. Astronomers redrew the boundaries of the constellations in 1922 publishing them as described here placing the feet of Ophiuchus/Serpent Bearer (just above the body the constellation of the Scorpion) on the Ecliptic. Since that time astronomers tell us that the Sun travels through Ophiuchus from Nov 29 to Dec 18 and have made claims about how this is the 13th sign. It is NOT the 13th sign. Signs are not based on constellations as they represent the seasonal cycle of Solstices and Equinoxes. Find out more in this article that explains why there are NOT 13 signs and find out what constellation the Sun was in when you born. This quote from The Fixed Star Site about Ophuichus is also from the book Star Names, Their Lore and Meaning by Richard Allen Hinkley published in 1899. In his book The Living Stars, Dr. Eric Morse tells us Ophiuchus is a symbol for Asclepius, the ancient Greek healer trained by Chiron and believed to be the ancestor of Hippocrates (born 460 BCE) where the Hippocratic Oath originates, and Serpens is his symbol of healing. Other imagery connected to Ophuichus and Serpens is kundalini (a Sanskrit word meaning ‘coiled up’ or ‘coiling like a snake’). The cultivation and management of this life-force has been the aim of these healers who utilized drumming, trance, chanting, hallucinogenics etc. to facilitate intuitive guidance to facilitate a cure. Ophiuchus, as the Serpent Bearer, therefore holds the key to the importance of Kundalini, life force energy and the wholeness or healing that comes from a healthy relationship with this energy. The association of the serpent (Serpens) with this constellation has also been linked with the miraculous powers of snake charmers, or shamans who were the tribal healers committed to holistic healing of both mind and body, using herbs, potions, charms, incantations, exorcism, magic, divination, and prayers, as means to establish a cure. The serpent as depicted in the caduceus is the symbol for the poison (venom) that can both cure and kill. Ophiuchus uses it to heal. The Healing Temples of Aesculapius were built near healing springs throughout Greece. After fasting and bathing, the patient spent the night in special ‘dream incubation chambers’ in these temples. The dreams of the patients helped to diagnose illness and suggest a healing protocol. 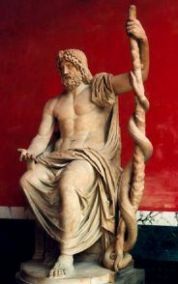 Asclepius was brought to the King of Crete, King Minos, to bring the king’s dead son back to life. The king’s son had died of a terrible illness. Asclepius told the king there was nothing he could do to help his son. Furious the king had his guards imprison Asclepius in a terrible place until Asclepius would agree to his demands. Asclepius felt doomed. Then a snake crawled into his cell through a small hole in the wall. Angered that this snake could come and go and he could not – Asclepius took out his frustration on the snake striking the snake with his staff until it was dead. After the snake was dead and Ascelpius had spent his anger killing it, he wondered why he taken such a violent action as it was unlike him to cause harm to another creature. Feeling sorry for his circumstances and concern for his sanity, Asclepius soon noticed another snake had entered his cell carrying an herb in its mouth. Asclepius watched as the snake spread the herb on what remained of its mate. More amazing still, the parts of the first snake began to heal and grow together again. After a few minutes, the first snake was whole and healthy again and both snakes returned back through the hole in the wall. However, the snake that carried the healing herb had left some of it behind. Aesculapius was a shamanic healer who learned how to bring the dead back to life. Eventually the God of the Underworld, Hades, complained to his brother Zues about all the dead leaving his realm suggesting this went against the natural order of life. Zeus agreed and destroyed Aesculapius with a thunderbolt and placed the constellation of the Serpent Bearer in the Sky as a reminder. Scholars feel that that the name Asklepios as described in Homer’s Iliad may come from the Greek askein that is the root of the word ascetic, a hermit or monk. The -epia, -epios, in the name Asklepios is variously translated ‘gentle’, ‘kind’, ‘calm’, ‘soothing’. The head of the Serpent-Bearer where the star Rasalhague is located is said to be filled with powerful, ageless healing wisdom that has the potential to restore and revitalize. When any planet travels through this constellation and by this star it is a time when it is beneficial to pay attention to your dreams and to ask for dream messages that will guide you toward your next steps. Each year from December 12 to 18 the Sun aligns with the star Rasalhague the crown chakra of Ophiuchus with the exact pass around December 14 or 15 illuminating the healing power of our dreams. This fixed star is strongly connected to the concept of healing, whether on a personal level or in society as a whole. The Fixed Star Site has extensive information about Ophiuchus worth noting from many resources giving us a place to begin to connect with the magic of the individual stars. However, many of the descriptions come from much earlier times, so Shamanic Astrology recommends you develop your own connection to these stars to see what meaning they have for you. In 2019 Jupiter expands our connection to Ophiuchus helping to facilitate more conscious dreaming. I am the Serpent Bearer additional article for a deeper look at these mysteries. a Saturn like character, and some of the undesirable Venus qualities are also present. Connected with these are Neptunian tendencies, making the native especially prone to infectious contamination caused by toxins. People thus influenced are easy going in the use of medical drugs, hallucinatory drugs stimulating foodstuffs, too much good living and overindulgence in tobacco and alcohol. Based on older writings we can see the qualities of this star were viewed more negatively. However, there are new insights that have been coming through in recent years. This one is from a book called Starlight Elixirs & Cosmic Vibrational Healing by Michael Smulkis and Fred Rubenfeld published in 1992. Ras Alhague can improve the transfer of aetheric energies into the physical body. These energies can strengthen the physical body when various forms of movement, martial arts, or dance are combined with visualization. Individuals involved in the development of the physical body who might have been attracted to substances such as steroids that artificially induce changes in the physical body would do well to utilize this elixir or meditation on the star. They go onto say the star beings connected to Ras Alhague developed techniques for material manifestation and communication that included the ability to relate to other people and other Star systems. This star is also beneficial to everyone involved in creative visualization especially around physical healing. It goes on to describe the energies from this star are amplified by physical movement when done from the perspective of love, acceptance, knowing, and even I AM. The result in essence is a way of moving Joy into our space/time reality through movement – when we intentionally choose it. Page Bryant in her book Starwalking: Shamanic Practices for Traveling into the Night Sky describes Ras Alhague as a dark star doing light work by shining light on negative karma (I prefer to use the word shadow because karma is often greatly misunderstood) within humanity for the purpose of evolving through awareness and willingness to own our darker side. When I tune into this star as the Crown Chakra of the Serpent Bearer (not gender specific) the intent I get is to have a healthy expression of this chakra energy and this star loves to assist us in creating it. When healthy the crown chakra expresses through unity consciousness and the knowing that that we – along with everything else – are connected at every level of creation often experienced as mystical union with everyone and everything in nature. This is not about getting it intellectually but rather feeling the deep peace, serenity and joy life offers us when we are connected to divine source through a profound sense of the cosmic order that underlies all of existence. So Ras Alhague is a star that helps us move beyond the limits of the personal ego (often expressing as our own negative shadow and uncertainity) so that we can connect into the unified field of love that permeates all creation unifying the finite (body/manifest plane) and the infinite (spirit/unmanifest plane) within and beyond time and space. Sekhmet wears the Solar Disk at the Crown Chakra with the Serpent sending out light from this chakra point. For me this is a great energy to work with in restoring what is possible when the crown chakra is fully activated, alive and functioning as it is meant to do. Why do the Hopi Indians use snakes in one of their Dances ? Sometimes called The Snake Dance. I witnessed the snake dance growing up near La Junta, Colorado performed by the Koshari Indians and what was shared then was it was a way to bring rain and they had many stories about how successful these dancers were in doing just that. Here is another point of view: For thousands of years the Hopi tribe of northern Arizona has performed a secretive, sacred ceremony that embodies the manifold and richly evocative archetypal nature of the serpent. In modern times the so-called Snake Dance (Tsu’tiki or Tsu’tiva) has gained notoriety, partly because its participants put live snakes in their mouths and wrap them around their necks. The species, both venomous and non-venomous, might include garter snakes, gopher snakes, bull snakes, sidewinders, and even rattlesnakes. The Hopi believe that their intimacy with rattlesnakes and other ophidian species engenders rainfall and fecundity upon the high desert. It does NOT represent the demonic element as displayed in most Pentecostal Christian churches. The biennial native ritual is held every other August during years that alternate with the Flute Ceremony. Cayelin, I dreamed I was walking in a forest in Switzerland on completely flat land. Before me a huge cone mountain rose up. I leaned back to see its height, back and back and back. At the distant top a subtle light shone. There was no way to directly climb the mountain, but to the west a long trail made an angled rising approach. Actually, the mountain was like a pyramid with a capstone. As I write, I could be at Chichen Itza where I visited on my ninth Venus return. And of course there is Kulkulcan! I think this is some of the most AMAZING information on the planet! I Pray a lot and receive a lot of Spiritual Blessings. He did not threaten me in any way. I have never had any dream like this before. It felt Very Powerful. I do not usually have scary dreams of any kind. Wow what a powerful dream and it just may be letting you know alligator is an animal guide for you. I dreamed about an alligator too though some years ago. They are very ancient beings and as a result represent primordial energies connected to Mother Earth as well as access to ancient knowledge and the power to survive! Powerful Indeed!!! Thank you so much for your article. Every year at this time I seem to have very prophetic dreams that often involve serpents and/or water. Your information has helped me understand more of the energy at play. dear Cayelin – this illuminates something buried in my sub conscious – a few of the dreams images of my last few nights have been SO REAL and tied to human (my) emotional states that while the context fades (because I do not journal) the images are very easy for me to carry into the next 24 hour period. Joyful blessings (as you ‘say’) on your thanksgiving, your work many moons ago was significant in ways I am just now knowing. Magical Joyful Blessings to you too at this Magical Time of year!